This is a rich and over the top chocolate dessert. It's perfect for your Christmas or Thanksgiving dessert table or any time you want to impress the chocolate lovers in your life. It's also the perfect romantic dessert accompaniment to a very special dinner for two. Whisk 1/2 cup heavy cream with egg yolks. In a heavy sauce pan or double boiler add chocolate, corn syrup and margarine and cook at medium heat until melted. Let cool. When cool add cream/egg mixture and stir to blend. Beat remaining 1 1/2 cups heavy cream, confectioner's sugar and vanilla until it forms stiff peaks. 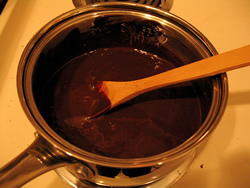 Fold gently into chocolate mixture until no streaks remain. Pour into plastic lined foil loaf pans. Press plastic wrap firmly over top of chocolate loaf. Let cool. 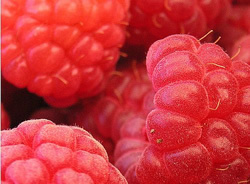 Place thawed raspberry's in blender and puree, then strain. Stir in 1/3 cup Karo syrup and blend well. To serve, spoon raspberry sauce on plate. Place a slice of chocolate truffle on top, then spoon more raspberry sauce on top of truffle.